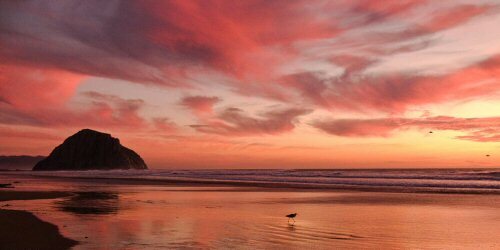 Morro Bay California - no mention or photo of this great beach city is complete without including the 581' Morro Rock. Morro Rock is the most westward of a series of nine volcanic plugs that ends (or begins) about 17 miles away in San Luis Obispo. It is very photogenic and you can drive out to it, but climbing is prohibited. The Rock is one of those natural features that are difficult to judge just how big they are until you are standing close. And Morro Rock is big. It covers 80 acres at its base! 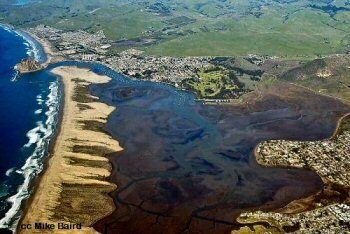 The City of Morro Bay began in 1870, and is situated along the harbor, which was first used for the shipping of dairy and ranch products produced in the area. Today it supports a commercial fishing fleet, Coast Guard station, sport fishing and marine tours like whale watching in addition to tourism. Translation of the name "Morro": "crown" or "turban" from the shape of the Morro Rock as seen by Juan Cabrillo in 1542. The city proper is found along the northern end of the bay, and the center of activity is right at the water's edge at the Embarcadero. Most of the residential area is a bit to the north, on either side of Highway 1. 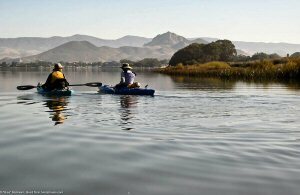 Morro Bay is a great place to stay on your visit to the Central Coast. There are many interesting and fun things to do right in the city itself, and it is close to many other attractions - Montana de Oro State Park, Hearst Castle, San Luis Obispo and the surrounding wine country. There are a number of great seafood restaurants in Morro Bay including Windows on the Water, The Flying Dutchman and Dorn's. The Museum of Natural History overlooks the Morro Bay Estuary, a unique habitat where fresh water meets ocean water. There are 13 city parks in this town! Field trips, ocean trips, lots of opportunities to observe the abundant winter avian visitors. 217 species were viewed during the 2012 event. Classic cars from around the country show off their shines. Taste and tunes on the waterfront. Morro Bay Harbor Festival, Inc.
What fun! Enjoy a day of family activities ending with fireworks. Sample guacamole 'til you see green. Across from Roses on the Embarcadero from 11am to 6pm. Centered at the main fishing pier and waterfront area. Wine and seafood faire, arts & crafts and live entertainment. Arts and crafts from 10 to 4pm on Morro Bay Blvd. A family-friendly festival of light. Begins at the city entrance with the roundabout at Morro Bay Boulevard. Local boats, of all sizes, decorate with lights for the holiday season and cruise the harbor.